This little extension exercise for the Sand and Water Globe is good for some children. First I bring out the Sand and Water globe and talk about water being blue and land being tan. Then I also show an inflatable earth. I talk about the inflatable earth being the same thing as the sand and water globe. 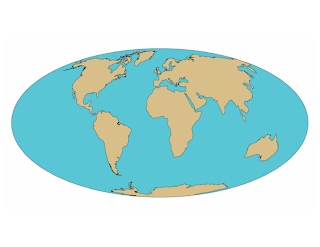 Then I show them the following colored "flat map" of the earth. 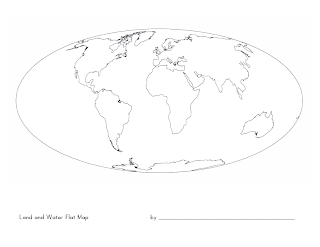 I ask the child which one the flat map looks like, the inflatable earth or the sand and water globe. When they say that the map looks like the sand and water globe, I give ask them what color the land is on the flat map and then what color the water is on the flat map. After this little presentation I let the child know that they are ready to color their own land and water map if they would like. They are welcome to use markers, colored pencils, crayons, or paints. I say that they should use the colored map as a reference.